Cold Laser Therapy is an effective, non-invasive treatment that promotes soft tissue healing, reduces inflammation and aids in the regeneration of nerves. It works by delivering a deep penetrating light or “photons” into the cell causing a positive physiological change to occur. These positive physiological changes aid in the body’s natural healing ability and accelerate the healing process. This results in the reduction of inflammation, muscle spasms and pain so that you can get back to doing the things you love to do! The Cold laser stimulates and speeds the repair and healing of the injured or damaged tissue. As the laser painlessly penetrates the skin, healing energy is delivered into the tissue, supporting our body’s own natural healing. The laser light is directed over the affected area close to the skin. Cold laser is non heat producing but patient’s sometime report a warm sensation over the affected area as the body responds to the process. Recovery time and reduced symptoms vary depending on the patient and degree of injured tissue. Some patients may notice immediate dramatic improvement of symptoms after just a few sessions while other patient responses are more subtle and gradual. Treatment protocols will vary depending on the patient and their condition. 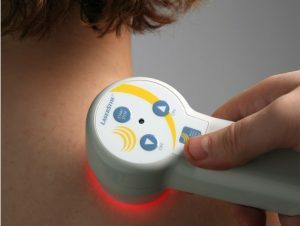 Cold laser therapy can take less than 10 minutes then you are on your way to healing. Call our office for a free consultation to see if laser may be right for you! “My tennis elbow is gone. I had pain for over 2 months and Cold Laser Therapy gave me a complete recovery…” Linda C.
“Cold Laser Therapy was applied to my lower ribs and my right knee over a two-week period. After the first session, my knee pain was reduced and I could climb stairs with little or no pain…” Marcelle K.